Hangman Creek is the delight of river-running opportunists, the bane of procrastinators. Like so many things we overlook in our backyards, the stream has been ripe for paddling off and on since mid-February, with few takers. Most of the year, especially in summer, the flows are too low for paddling in stretches such as the one along Qualchan Golf Course. The exceptions are during mid-winter thaws, late-winter runoff, and the occasional soaking rainstorm of summer and fall. Prime paddling flows can develop in hours, and disappear nearly as fast. In these brief moments of opportunity – such as those weather has delivered in recent weeks – sections of the creek are standout paddle trips with scenic rock and sand cliffs, wildlife, and playful rapids. The official name for the creek is either Hangman or Latah, depending on which official source you cite. Some people like “Latah” for its softer ring that has links back to Lewis and Clark. “Hangman” Creek has the ring of history, becoming the common name after the military tricked several tribal leaders and hanged them along the shores in 1858. Some people prefer this name to prevent the cowardly act from being forgotten. Spokane County Commissioners adopted Latah as the official name in 1997. However, the Washington Board of Geographic Names rejected the county’s official name change petition that year. Hangman Creek begins in the St. Joe National Forest and flows roughly 70 miles through farm valleys from southeast of Tensed, Idaho, through Tekoa, Wash., to the confluence with the Spokane River. From the forest, it flows in a fecund ribbon of rock and greenery through Eastern Washington wheat country. Even where the creek wanders near the south edge of Spokane, it is an exceptional wildlife area. Paddlers will find sand beaches in lower flows signed with tracks of beavers, muskrats, great blue herons and waterfowl, white-tailed deer, and hawks. The upper sections of the river are rarely floatable. 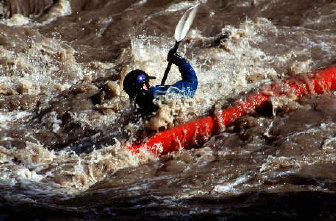 However, rafters and kayakers rush to run big flushes that create difficult Class 3 and even dangerous Class 4 rapids in the canyon east of Spangle. A new landowner in the area is not allowing paddlers to park at a traditional take-out this year, kayakers have reported. It’s up to paddlers to obtain permission or find public access. The river is tamer but challenging Class 2 water downstream from the Hangman Golf Course area to High Bridge Park near the Spokane River. Again, paddlers must seek permission to park and put in, although there is at least one option to launch from Hangman Valley Road, offering an 11-mile float to the Spokane River area, or make a shorter float from Campion Park just downstream from Hatch Road. Take-out options are available in Peaceful Valley or at the downstream side of the Riverside Avenue bridge over Hangman Creek at High Bridge Park. Gauging whether Hangman Creek is floatable can be tricky for the uninitiated. Half of the watershed is crop land. Gone are most of the forests, wetlands, and grass prairies that once filtered runoff, stored groundwater, and rationed flows into the creek through the year. Flows above 1,200 cubic feet per second are preferable to avoid banging on rocks in numerous riffles. Visually, if the creek is running fairly clear, it’s too low to float. For another rough gauge of whether this trip will leave the bottom of your boat unscathed, go to the Riverside Avenue bridge at the take-out. Look at the bridge abutment on river-left. The river should be high enough to cover the concrete ledge at the base of the abutment. The creek is susceptible to flooding that can alter the channel, form logjams, and drop trees into the water. The numerous riffles in this stretch are not a factor at adequate flows, but are definite boat denters in low flows. The stretch from Hangman Valley to the confluence has several Class 2 rapids that should be scouted. The the river braids into flats near Qualchan. Expect to bounce or step out of the canoe here in flows of less than 1,200 cfs. After flowing along Highway 195, the creek makes a hard right turn at a railroad bridge (with a standing wave that can be avoided) followed by a hard left turn that can be tricky for some paddlers. From here, boaters will see the effect of man’s hand in straightening Hangman Creek for flood control in the early 1930s. The channel becomes deeper, narrower, and boulder-strewn. The flows increase through a long stretch known as Railroad Rapids. Perhaps the most notable obstacle is Big Rock Hole, a large midstream obstacle just past the Chestnut Street bridge. The big rock forms a challenging standing wave, and a hole at certain flows. Scouting is recommended. The last stretch of the trip flows under the elegant arches of the old Sunset Highway bridge, a scenic perch for nesting peregrine falcons in recent years. The float ends just past Spokane’s rustic High Bridge Park. If you were to proceed a short way beyond the take-out, you’d reach the Spokane River and the site of a proposed whitewater park. In summer, when Hangman Creek is too low to paddle, there is a large beach at the confluence. Beach patrons do not always wear swimsuits.